Life with Bethie the Boo: Brown bear what do you see? Very brown outfit today! The mercury is going above freezing today so I felt like digging out a skirt. 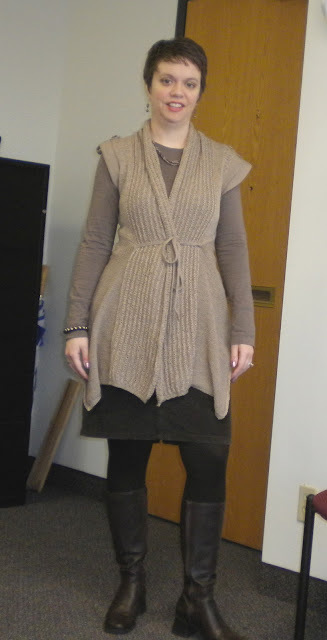 I originally put a longer skirt on with this sweater and didn't really like it, so I went for a shorter one here. It's a rather layered outfit too, guess I'm getting more practice for next week's Layer Up challenge! So I look very much like my mother. If you've met her or are one of my friends who knows her, you're probably going, yes Beth and the Pope is Catholic. In other words, this is not new information, but I'm struck sometimes by just how much I look like her in some pictures. Some days I just really see it more than others. I don't have a comparison picture ready to share but I'll put one up sometime so you all can see what I mean. I honestly don't mind looking so much like her. She's aged well so far and doesn't look old enough to have a 30 year old daughter, so that makes me feel confident that I will age well too! I've been back to using my Olivia and Joy bag again. I have really been liking a bag that can be worn cross-body if I can do so this winter. And a longer strapped bag has been easier to wear with a bulky coat too. Funny story about this bag - we were sitting watching TV the other night and the Pants Monkey was going upstairs to get one of my cupcakes. I had Big Pippin curled up on my lap and she was super comfy. We have a joke about not being able to do things because we have "COL" or "cat on lap" disorder. I wanted my cell phone and didn't want to disrupt Pippin so I asked the Pants Monkey to bring it back with him. I said it was in the zipper pocket of my bag. He's gone for a little bit and soon yells down "Which zipper pocket, this bag has like hundreds of them!" I had to explain that actually, most of the zippers are not actual pockets, they're just for decoration. He finally found it after that. And of course, Pippin jumped up off my lap as soon as he was back! We're almost to the end of the week friends! Hoping today is less eventful than yesterday. If you follow my Twitter feed you might have seen a tweet from me about having to call in the theft of a plant from my office building. I'm not kidding. You can't make this stuff up. Oh the life of an admin. You know you're jealous. I love that outfit! The sweater is super cute!! Too funny about the Pants Monkey with the purse...LOL. i don't look like my mom AT ALL--just my dad. who wants to look like a dude? hmph. Who steals an office plant? Eventually someone will just give you a plant in just about any office, because they are tired of watering it. Love the vest and that awesometastic bag. I think the shorter skirt looks well balanced with the sweater vest. Cats do the darnedest things. I hate to disturb them when they're all settled. They get all cute-angry. Glad you went with the shorter skirt! Looks great with the vest.